Despite their imposing size, Wookiees are normally peaceful and proud. After years of suffering under Imperial rule, however, many Wookiees have taken to the battlefields of the Galactic Civil War as members of the Rebel Alliance. 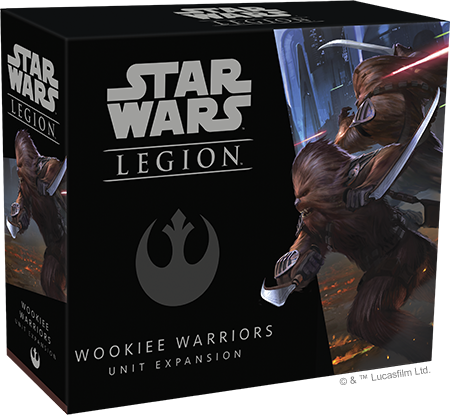 Fantasy Flight Games is proud to announce the Wookiee Warriors Unit Expansion for Star Wars™: Legion! Order your own copy of the Wookiee Warriors Unit Expansion at your local retailer or online through our website today! The Wookiee homeworld of Kashyyyk has seen its share of intergalactic conflict in recent decades, and the Wookiees will do whatever it takes to protect their home. Although they are a rare sight on the battlefield, Wookiees can quickly enter a berserker rage that any surviving enemies will not soon forget. Within the Wookiee Warriors Unit Expansion, Rebel generals will find everything they need to add a group of Wookiees to their army as a special forces unit. 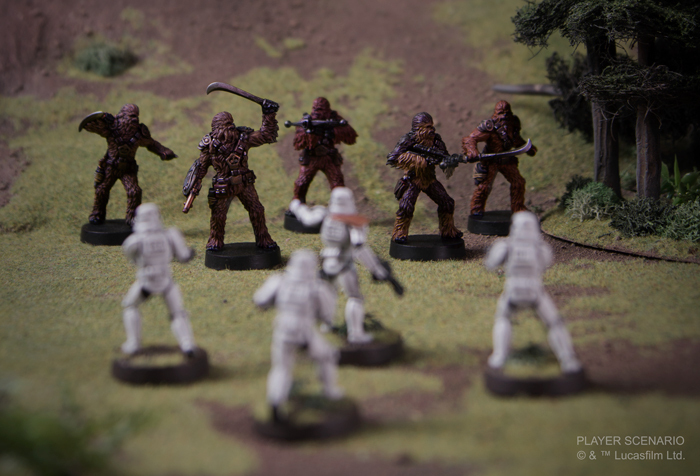 Four unpainted, easily assembled miniatures show the Wookiees charging into the fray, brandishing their Ryyk Blades. In the same expansion, you'll find five unique upgrade cards to prepare the Wookiee Warriors for whatever they may face on the battlefield. 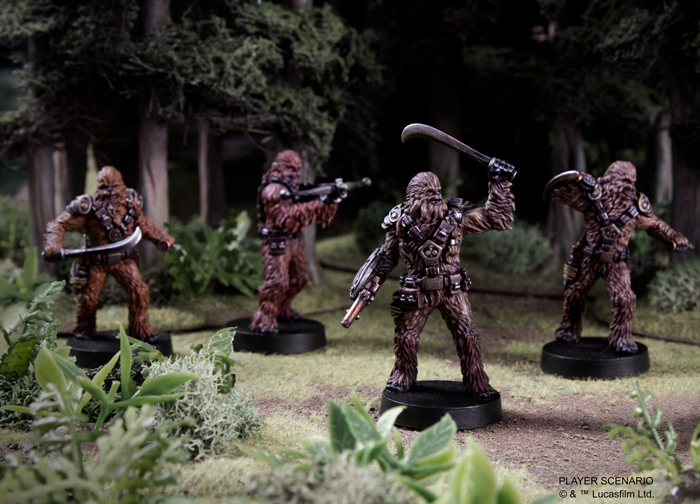 The Wookiee Warriors Unit Expansion will release alongside the Chewbacca Operative Expansion in the fourth quarter of 2018, giving you the chance to bring Kashyyyk’s finest to the battles of the Galactic Civil War as they play out on your tabletop. 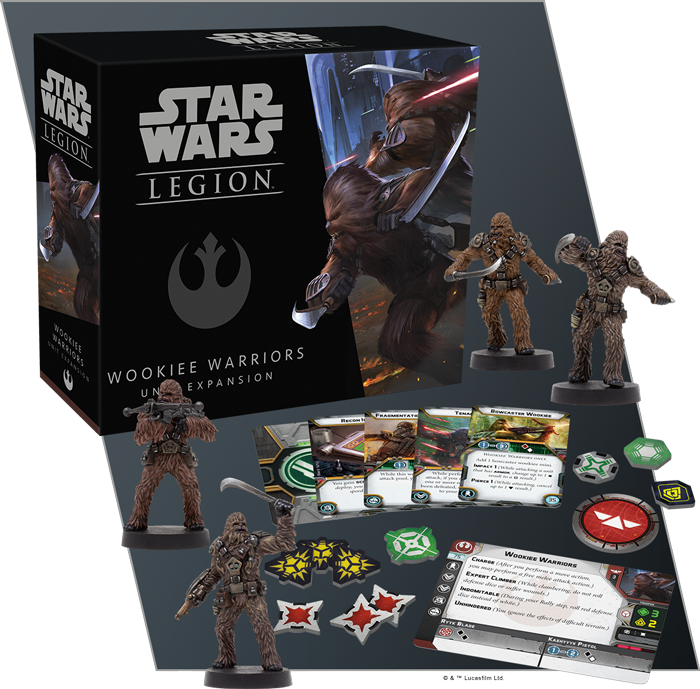 With their introduction into Star Wars: Legion, the Wookiee Warriors take their place alongside the Rebel Commandos as the Rebellion’s options for special forces. Standard infantry units, such as the Rebel Troopers, are more than capable of battling Imperial Stormtroopers head-on, but your battles will rarely focus solely on destroying enemy units. You’ll need specialized troops if you’re going to accomplish your objectives, and the Rebel Commandos and Wookiee Warriors present drastically different options for doing so. Unlike the Rebel Commandos' tendency for stealthy infiltration and sabotage missions, the Wookiee Warriors prefer more direct confrontations. As you might expect, their massive strength serves them well in melee combat and their Ryyk Blades make them all the more deadly. Each Wookiee wielding these weapons contributes two black dice to a melee attack, making them ferocious opponents up close. Ryyk Blades aren’t the only weapons Wookiees carry into battle, though. The bowcaster is a traditional Wookiee weapon, and if you’re looking to attack from a distance, a Bowcaster Wookiee heavy weapon miniature is a perfect complement to the Kashyyyk Pistols carried by standard Wookiee Warriors. This weapon helps you cut through enemy blocks and armor, but it's most effective when it’s being used within the more limited range of the Kashyyyk Pistols. Every Wookiee Warrior contributes two black dice to a melee attack! There are few who can match Wookiee Warriors in terms of raw combat strength, but perhaps their biggest contribution comes in their other natural abilities. Wookiees are strong climbers, and can easily clamber up obstacles that other species would find too treacherous. 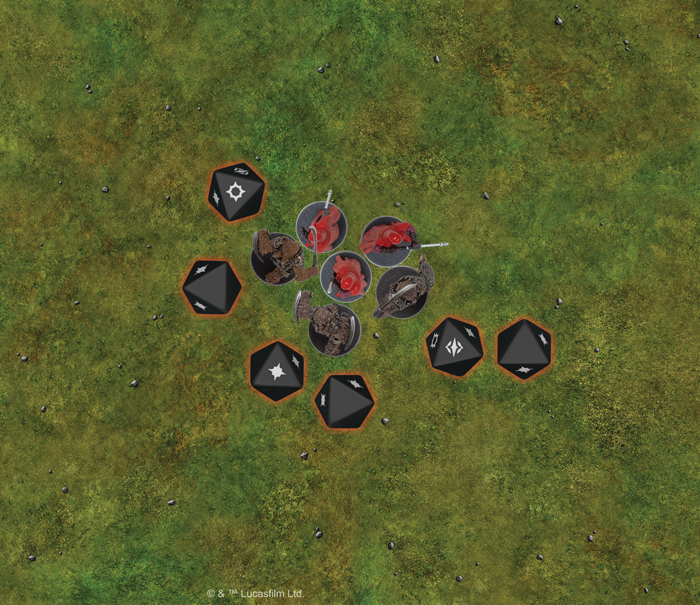 Likewise, they have no problem moving across difficult terrain, making them a unit uniquely suited to rush straight toward the nearest objective with little worry about what’s in the way. We’ll take a closer look at everything included in the Wookiee Warriors Unit Expansion in a future preview! The warriors of Kashyyyk are some of the most ferocious in the galaxy. Soon, they'll be able to lend their strength to your fight against tyranny in all its forms. The Wookiee Warriors Unit Expansion (SWL25) is releasing alongside the Chewbacca Operative Expansion (SWL24) in the fourth quarter of 2018. Pre-order your copy at your local retailer or online through our website today!